How to Paint a Striped Wall — 5 O'CLOCK DESIGN CO. I am so excited to share this project with you because I absolutely love how it turned out! I've been thinking about it for awhile but hadn't found the time, or nerve, or something to get it done. This isn't my first go-around with painting stripes on my walls, but this is definitely the most bold. Last time, I painted a wall in our living room with vertical stripes in two very similar shades for a calm, subtle look. This time I decided horizontal stripes were right for two reasons: with high contrast colors I didn't want to risk the circus tent effect, and because this is in an entry/hallway I felt like the horizontal stripes would be welcoming and draw you into our home. So, without further ado--our new striped entryway! 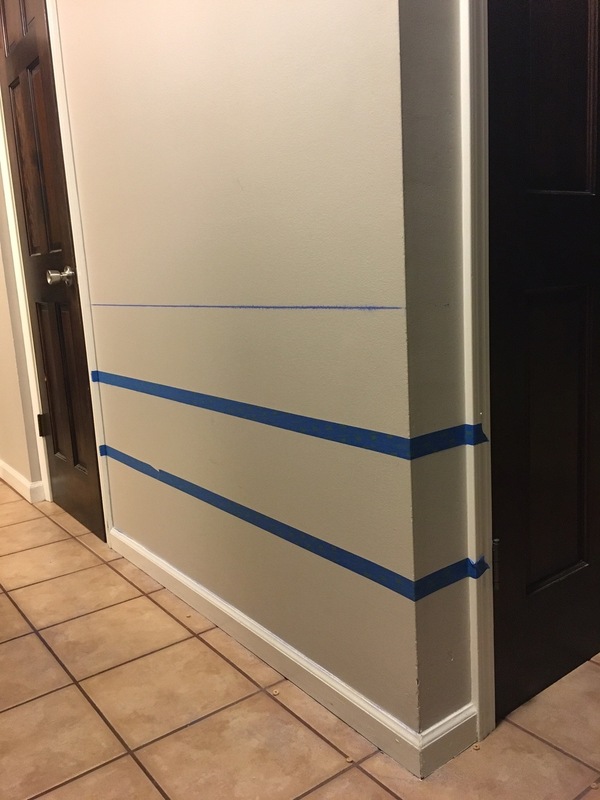 Before I started with any taping or painting, I made a quick sketch of the wall and made note of the wall height so I could calculate how many stripes I wanted and what size they needed to be. The wall is 90" - 3" baseboards, so the total height I needed to divide into stripes was 87". 87/9 = 9.66 or 9 2/3. I decided to make my marks at 9 3/4 because this was an easier increment with the tape measure I had on hand. I started measuring from the bottom, so that the difference would be made up at the top of the wall, further from the eye. I decided to measure and then tape each line as I went so I didn't risk losing, or confusing, my tiny pencil marks. My husband was so kind to help me with this part of the process (it is MUCH easier with two people!) and had the genius idea to use a chalk line. This helped connect our measurements in a straight line that we then used as a reference to tape. Pro Tip: When measuring and taping, remember that the tape counts in your measurement. The stripes that are meant to be painted will appear larger because the size of the tape (in this case 1") is being counted into the height of the not-to-be-painted stripes. This means that for the sections you wish to paint, measure between the tape, and for the other sections, measure including the tape. Pro Tip: Place a small piece of tape inside the stripes that you are not going to paint so you can clearly see the difference. Pro Tip: Seal down the edges of your tape with paint the same color as the wall/not-to-be-painted stripes. This ensures that any tiny bleed through or wicking of paint will blend right in, giving you a crisp, clean line.